After my great Nashville visit, I headed on down to Huntsville, AL last week. I was able to meet with a lot of SOLIDWORKS customers and users. I presented at the April 2015 meeting of the North Alabama SolidWorks User Group (NASWUG) about the topic of Model Based Definition (MBD), how to apply it within SOLIDWORKS. I also demonstrated the new SOLIDWORKS MBD product which streamlines SOLIDWORKS for MBD processes and provides 3D PDF output for non-CAD consumption for the purpose of contributing to Technical Data Packages (TDP). There was a lot of great questions by user group meeting attendees about implementation Model Based Definition, the standards that support Model Based Definition (such as MIL-STD-31000), and Product and Manufacturing Information (PMI) solutions available in SOLIDWORKS, such as DimXpert. I’m glad I had the opportunity to visit Nashville and Huntsville, along with many SOLIDWORKS customers in these areas. I learned a lot, and I also hope I provided a lot of new information to those interested in MBD and SOLIDWORKS in general. I was recently interviewed by Entertainment Engineering, an online magazine that covers technologies used in many types of entertainment devices and events such as movies, concerts, theme and amusement parks, electronic games, etc. The November 2012 issue focuses on the value of individual contributors and also of teamwork in the design process. Here’s the kicker, I’m quoted in the issue’s editorial article along side the great Steve Wozniak. Kinda cool. The article for which I was specifically interviewed is called Teamwork Improves Section-View Options in SolidWorks 2013, which leads-off a series of interviews with various individuals from all over the engineering discipline. In my interview, I talk about the new SolidWorks section view functionality (now called Section View Assist) that has a whole new user interface that changes the way section views are created on drawings in CAD. This includes how I originally developed the concept which was then improved and refined via teamwork within the SolidWorks organization. Section View Assist replaces the need to first create sketches before being able to create a section view. Instead, you can directly place cutting line on the original view and have the section view generated automatically. If you want to use aligned section view, you can add offsets to the cutting line directly in the Section View Assist interface (without the need to draw lines or edit sketches). Same goes to notch and single offsets. The new user interface saves time and steps. The improvement is nearly exponential. The more complex your cutting line, the quicker you can create it versus old methods using sketches. 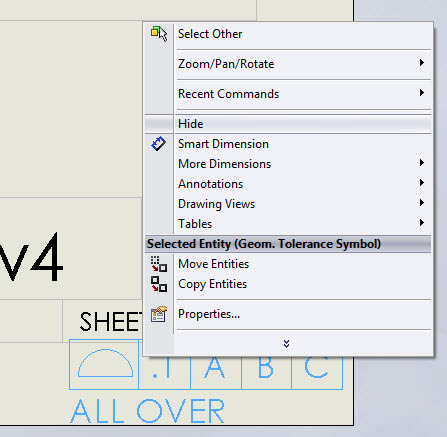 SolidWorks Sheet Formats do not support Geometric Tolerance frames. So, what can be done if you wish to display a frame with your Sheet Format on drawings? First, a quick review. 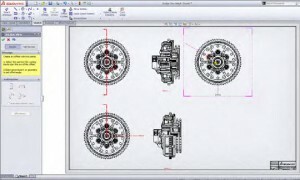 SolidWorks has two separate files that serve as the starting point for creating new drawings. The primary file is the Drawing Template (*.slddot). Every time you start a new drawing, it must be from an existing Drawing Template. The template contains all the settings and other information needed for every drawing. In particular, it uses information from a Sheet Format (*.slddrt) for the border and title block. 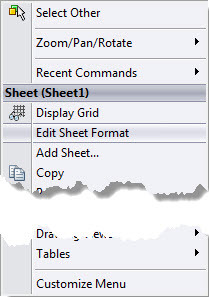 Each time you create a new sheet on your drawing, the Sheet Format is directly loaded. 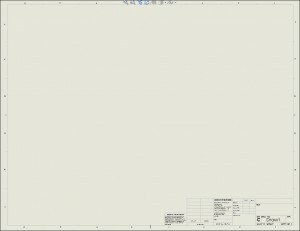 However, neither the Sheet Format or the Drawing Template automatically update existing drawings. For more information on Sheet Formats and Drawing Templates, see SolidWorks Help. The tip found in this article is for more advanced users and CAD Administrators that are already familiar with these topics. Back to the story. Perhaps your company is moving towards using the model to define your product, but still uses the drawing to established specifications, such as tolerances, general notes, process control dimensions, etc. Common practice for this scenario is to establish a generic Profile specification on the drawing that is then applied to the model. But, you cannot store a Geometric Tolerance frame within a Sheet Format. You won’t likely want to draw your frame using sketches. Solution? 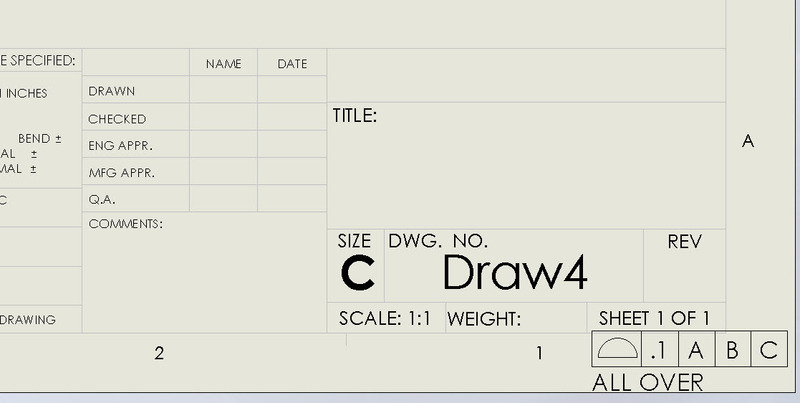 You can have a Sheet Format display a Geometric Tolerance frame that is present on a Drawing Template! Here’s how. 2. Create your Geometric Tolerance frame using the Geometric Tolerance annotation tool. 3. Place your new frame in the lower right corner of your Drawing Template. Don’t be concerned if it overlaps the border, but it is a good idea to keep it inside the paper space. 4. Create an annotation note (Insert>Annotations>Note…) and place it anywhere on the drawing. 5. While the annotation note is still being edited, click on the Geometric Tolerance frame. The frame will now appear in the note. Select OK to accept. 6. Select the new note. 7. Press CTRL-X. The note should disappear, as it is being cut from the Drawing Template. 8. 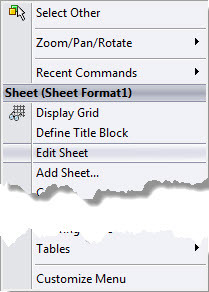 RMB click on any empty area of the blank paper space and select Edit Sheet Format. This will take you into the Sheet Format editing mode. 9. Click on the approximate location where you wish the frame to appear and press CTRL-V. This will insert the note onto the Sheet Format. Click and drag it to the desired location. 10. RMB click on an empty area of the paper space. Select Edit Sheet. 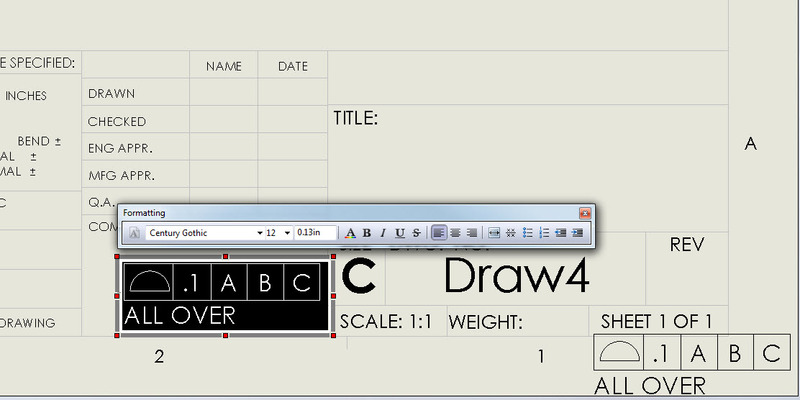 This will exit the Sheet Format mode and return you to normal drawing mode. 11. RMB click on the original Geometric Tolerance frame and select Hide. 12. Goto File>Save to save your Drawing Template. 13. Goto File>Save Sheet Format to save your Sheet Format. (14.) Now, if you wish to edit the frame later, simply use View>Hide/Show Annotations. The hidden frame will appear faded gray. Select it and it will turn black. Press ESC to exit the Hide/Show mode. Edit the frame as your normally would any Geometric Tolerance frame. When done, hide it again. You may need to Rebuild to see the update. Note: If you open the Sheet Format directly without loading the Drawing Template or if you load the Sheet Format into a drawing created with an older Template, the annotation note containing the frame will be blank. This is because the information is contained in your new Drawing Template, but the note is in the Sheet Format. GD&T Feature Control Frame user interface? Remember this old faithful interface for creating Geometric Tolerance frames (a.k.a, GD&T feature control frames, or GTOL annotations)? 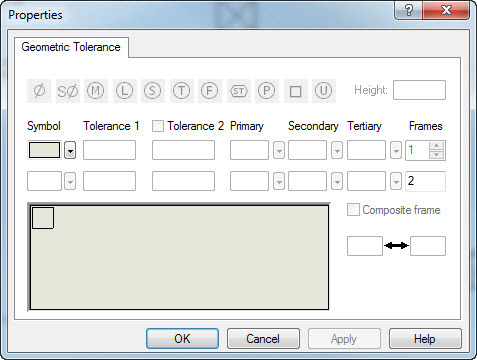 There a new thread on the Drawings forum at SolidWorks Forums asking about how you use this user interface to create Geometric Tolerance Frames. Your input is very welcome there (and here, if you wish). What would you do to improve the inferface? could just see your frame being modified directly on the sheet)? GD&T rules) ever prevent you from creating the frame that you need? Author fcsuperPosted on June 22, 2012 June 22, 2012 Categories ASME Standards, DrawingTags GD&T, tolerance2 Comments on GD&T Feature Control Frame user interface? 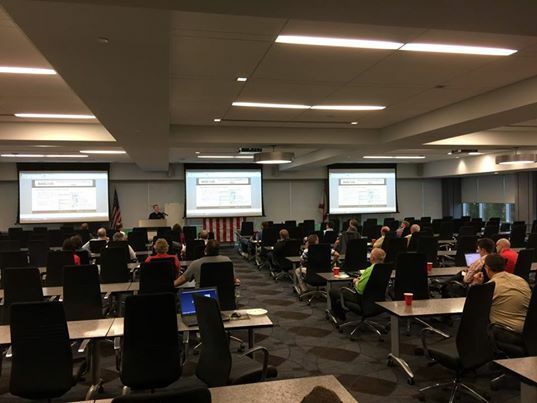 Hari Padmanabhan and myself presented at the Center Massachusetts and Northern Connecticut SolidWorks Users Group (CMNC-SWUG) yesterday evening. The meeting was very well attended. It’s prolly the largest user group meeting I’ve seen. However, from what I understand, this is par for the course for this region. Hari gave a very detailed presentation on SolidWorks Animation. He demonstrated functionality on solid models of real-life toys that he had also brought in. He also did a great job of explaining the differences between the three modes within Animation, called Animation (simple point to point movement), Basic Motion (game engine physics) and Motion Analysis (complex physics model). My own presentation covered DimXpert and TolAnalyst. DimXpert is one of those capabilities that seems to be under utilized because people are simply unfamiliar with it. It is a powerful and fairly easy to use tool. It’s not a whole lot different than dimensioning a drawing, except that DimXpert dimensions and tolerances actually have a fundamental understanding of what they are controlling. Technically, CMNC-SWUG is my hometown user group, so I’ll be looking forward to their further events. American Design Drafting Association is hosting the 53rd annual Technical & Education Training Conference on March 27-30, 2012 at the Hard Rock Hotel in Tulsa, Oklahoma. The theme this year is “Training with Evolving Technologies”. The conference is a 4 day event focused around building drafting and design skills. There is heavy focus on drawing standards by ASME, in particular GD&T and ASME Y14.5-2009. CAD technologies are also well covered. Though this is not one of the larger trade conferences, its tight focus on design and drafting puts it at the top for training in the area of ASME standards, in my opinion. This will benefit individuals who need more in-depth skills related to GD&T and drafting (even when paper drawings aren’t used). The two day workshops on GD&T are particularly valuable. Due to scheduling conflicts, I won’t personally won’t be able to attend this year, but I do hope to get a chance to go again within the next couple of years. The early bird special for people who register by March 5, 2012 is $100 off the attendance fee. More information may be found at their registration form page. Description of workshops for this conference are now available.